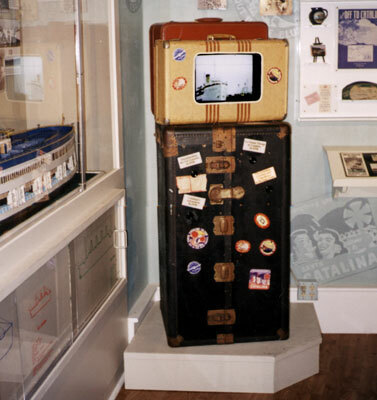 Four vintage film clips (transferred to video) of steamship travel to Catalina Island are presented by pressing one of four pushbuttons on the steamer trunk. The corresponding backlit "travel sticker" lights during the presentation. This exhibit originally used a LaserDisc player and INNOVA's LaserDisc Controller. Additionally, a dome-type speaker above the exhibit helps prevent audio bleed-over into other exhibit areas. The LaserDisc player was replaced with a FlashVideo pushbutton video player for greater reliability and flexibility. Catalina Island Museum also uses FlashVideo for temporary and changing exhibits. Click here to see its use in the Catalina Fire Exhibit.